Before adding 2 bars of gulaman, make sure you remove the pandanleaves and check if the remaining water is equal to 8 cups – 1 bar of gulaman is good for 4 cups of liquid. 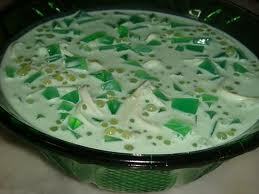 If it is not 8 cups, less will mean hard gulaman and more than 8 cups will result in mushy soft gulaman. Meanwhile, mix the grated buko with the 3 cans of cream and 1 can ofcondensed milk. Served with Vanilla Ice Cream on top for a more delectable treat.